Can I buy two black ink cartridges for the Deskjet 500? Black HP Deskjet 500 cartridges are sold individually so you would need to add two to your basket. A discount will be applied to your order for quantity buying. An old model from HP, the HP Deskjet 500 is a monochrome inkjet printer that offers basic printing functions. It is built for light to heavy home use, offering a monthly duty cycle of up to 1000 impressions. This personal printer is a good fit for homes. Those who need a more versatile colour printer should go for newer models that offer faster speeds and higher print resolutions. The HP Deskjet 500 inkjet printer is only suitable for users with minimal monochrome printing needs. The HP Deskjet 500 printer is quite a bulky model, measuring 17.2x7.8x14.8 inches. It weighs a whopping 14.3 pounds which is almost equivalent to lightweight multifunctions. The HP Deskjet 500 uses parallel port, and does not offer USB or wireless connectivity. The paper tray can hold a minimal quantity of paper, and has to be manually fed as the unit does not have an automatic feeder. Users are satisfied with the quality of text prints that they get from the HP Deskjet 500 black and white inkjet printer. However, photo prints can be quite grainy, even when using quality glossy paper. The Deskjet 500 is inexpensive to run and has been popular with home users who don't require colour printing for many years now. 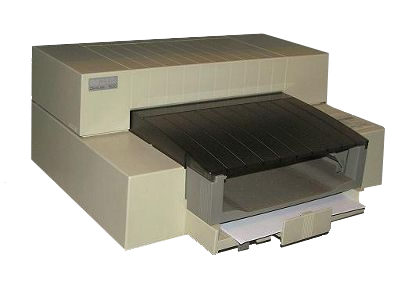 In addition to being a monochrome printer, the HP Deskjet 500 can be quite bulky for a single function printer, plus, it does not offer many connection options. Print resolutions are low at 300x300 dpi, and users find manually feeding paper into the machine quite annoying and counter productive. With top prints speeds of just 3 ppm, the Deskjet 500 printer will not be winning any awards for efficiency either.